Below are the official 2017 Hockomock League Field Hockey All Stars, selected by the coaches in the league. 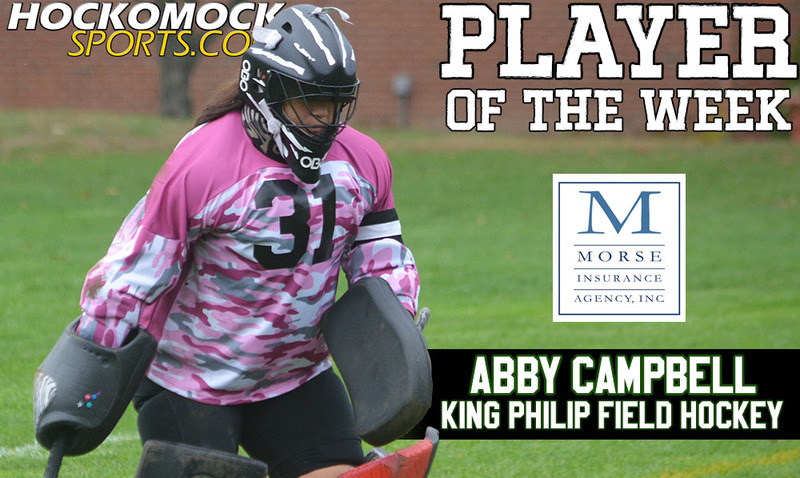 King Philip senior Abby Campbell has been selected as the HockomockSports.com Player of the Week, presented by Morse Insurance, for Nov. 5 through Nov. 11. 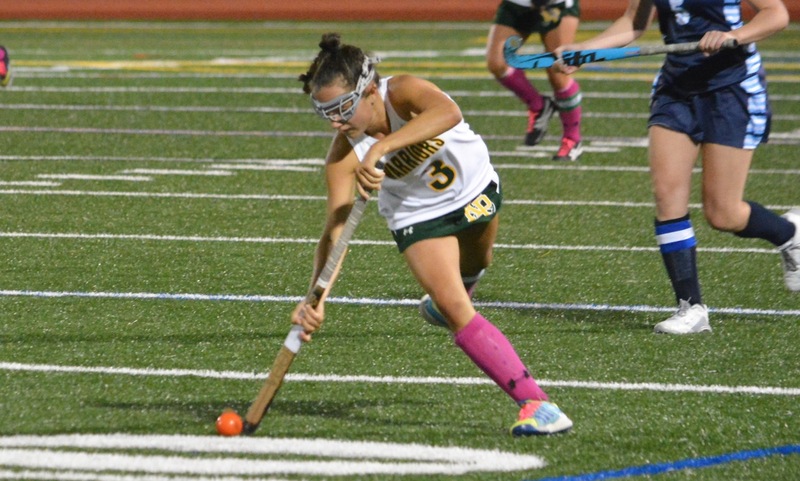 Campbell is the 10th player selected for the 2017-18 school year, first field hockey player to be selected, and third King Philip athlete to be chosen this fall. Campbell has anchored one of the best defensive units in the state and helped the Warriors win three playoff games last week, including the D1 South Sectional Final on Saturday afternoon at Taunton High School. 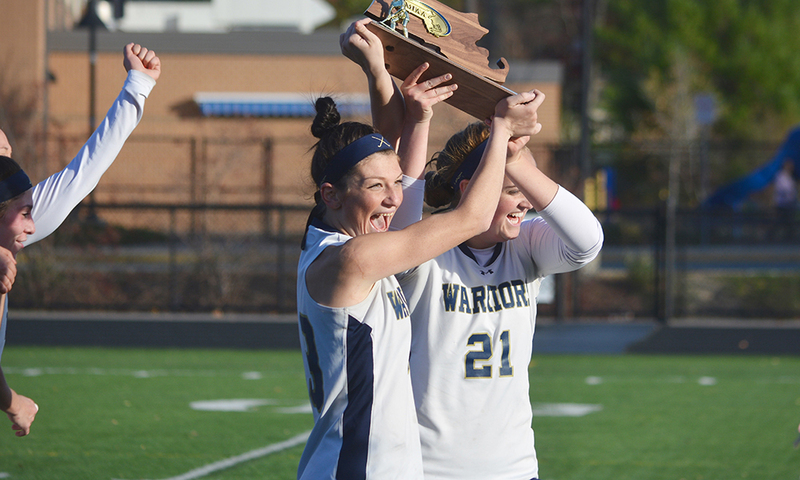 In the quarterfinal round, Campbell had 10 saves against a strong Needham team. The Warriors advanced with a 5-2 win over the Rockets. In the semifinal round, Campbell turned away seven shots with the lone goal allowed coming on a penalty stroke. KP edged the Dragons 2-1. In the sectional final, Campbell and the KP defense had one of its best performances of the season. The Warriors shut out top-ranked Somerset-Berkley’s high powered offense. Campbell made nine saves in the win, and along with the defensive unit, turned away 11 penalty corner chances by the Raiders in the second half alone. King Philip takes on North sectional champion Andover on Tuesday night at Braintree High School in the D1 State Semifinal. The Player of the Week, presented by Morse Insurance, is selected by the HockomockSports.com staff. Nominations can be submitted throughout the week up until Saturday night at midnight. There may be a poll posted on every Sunday with the nominations. The results of the poll influence the selection but do not strictly dictate the decision. TAUNTON, Mass. – With just under four minutes to play, top-seeded Somerset-Berkley ramped up its offensive pressure and had four consecutive penalty corners. Holding a 1-0 lead, King Philip head coach Liz Hathaway thought about using her timeout to try and give her defensive group a breather to settle down. But instead of giving the Raiders a chance to draw something up, she put full trust in her defense and goalie. All four of the corners were thwarted by KP’s defensive unit of Christina Hathaway, Carolin Klim, Emma Izydorczak, and Nicole Connor, along with senior goalie Abby Campbell. The first corner had a shot from Somerset-Berkley defender Alex Millar blocked by a KP defender’s foot, giving the Raiders another chance. That ensuing corner found its way around the area but was blocked away at the near post by Campbell. With just two minutes to go, the Raiders had another corner but once again KP’s defense stood tall and the Warriors walked away with a 1-0 win to win the D1 South Sectional title. “I was contemplating taking a timeout with two minutes left to get them to settle but I kind of wanted to get a big out to get some momentum and they ended up doing that,” Liz Hathaway said. Despite Somerset-Berkley having an 11-1 advantage in penalty corners in the second half alone, Campbell and the Warriors notched the shutout. After a start that featured little offense from either side, King Philip started to take control. Sammy Robison took away a partial breakaway chance from Lucas Crook in the eighth minute, and Crook blasted a shot wide on the Raiders’ lone corner of the half. “We just wanted to play Somerset-Berkley, the team,” Liz Hathaway said. “We wanted to avoid all the other stuff (Somerset-Berkley has two male players in the starting lineup) and just focus on our game. We didn’t really make any adjustments for them, we knew what to expect how they played, and we did it. We played great team defense. Beyond that, the ball was mostly in KP’s attacking area. The first shot on goal came 18 minutes into the game when Christina Hathaway rifled a low shot that forced a big kick save from SB keeper Madison Ferrara. KP had an 8-1 advantage on corners in the first half but only had two shots on target. The Raiders had the first chance of the second half on a long shot from Camryn Crook but Campbell did well to come out and made a big kick clearance. King Philip turned that save into a counterattack flying up the field with some numbers. After slowing possession down in the offensive third, junior Alli Meehan ended up with the ball on her just outside the area. She used her speed to weave past a pair of defenders and release a shot on target. The ball beat the goalie but was stopped by a defender’s stick just on the goal line, but the rebound popped right to Nicole Connor, who wasted little time depositing her shot into the cage. “We knew we wanted to win in regulation and not going into 7-v-7 because from what I understand, they have two of the six field players who are faster and stronger. We didn’t want to get into that situation. Connor’s goal came with just over 15 minutes to play. The Raiders earned over half of their 11 penalty corners after KP took the lead. King Philip field hockey (19-2-1) advances to the D1 State Semifinal to take on North sectional champion, Andover (20-0-1) on Tuesday, November 14th at Braintree High School at 5:00 PM. #3 King Philip, 2 vs. #6 Duxbury, 1 – Final – King Philip scored once in each half and never trailed in a win over Duxbury, advancing to the D1 South Final. Alli Meehan put the hosts up 1-0 in the first half but Duxbury tied the game in the final seconds of the first half. Claire Lawler scored on a penalty corner in the 40th minute for the game-winner. KP head coach Liz Hathaway noted that goalie Abby Campbell (seven saves) and Sammy Robison played well defensively for the Warriors. #4 Canton, 2 @ #1 Somerset-Berkley, 3 – Final (OT) – Click here for a recap and photo gallery of this game. WRENTHAM, Mass. – You couldn’t ask for much more out of a field hockey game between two rivals, and two of the top teams in the Hockomock League. King Philip junior Dana Truini scored the game-winning goal just over halfway through double overtime to help the second-seeded Warriors edge #18 Franklin, 3-2, at Macktaz Field. “It’s really tough [to play a team three times], that’s why I was worried about this,” said KP head coach Liz Hathaway. “I thought we had them when we scored in the first couple of minutes and I thought we were on a roll. Then they executed a great game plan. They force us to play a big ball game. Instead of working on possession and transfers, we kept trying to go big and they stepped up to intercept and go on the counter-attack. We did better with that in the second half. King Philip swept the regular season series, but the Panthers used all 30 minutes of each half to keep the game level. First, it was scoring the tying goal to make it 1-0 with less than a minute to play in the first half. And then in dramatic fashion, the Panthers knotted the scored at 2-2 with just 10.4 seconds to play in regulation, sending the game to overtime. “I’m really proud of my kids, really proud of them,” said Franklin head coach Lisa Cropper. “The first two games in the regular season were close, the scores weren’t indicative how close the games were. And another close one today. After a scoreless first overtime period that featured end to end action, and scoring chances for both sides, the Warriors started to take control. Franklin goalie Christina Luccini robbed Truini just two minutes into the second overtime period, making a point-blank save on a rebound chance. Luccini came up big again just two minutes later, making a kick save on a chance from Liz Furfari inside the area. Thirty seconds later, Luccini turned away a big shot from Christina Hathaway. KP finally beat Luccini on a cross just over seven minutes into double overtime, but Franklin defender Emily Valentino was in the right spot and kept Truini from getting a touch. Before the Warriors put their sixth penalty corner into motion, Hathaway called a timeout, setting up a play. Nicole Connor sent the corner to the stick of Furfari, who patiently waited before connecting a cross to the weak side where Truini buried it with a one-timer for the winner. “I knew out seven on seven unit was really good because we just practiced it the other day in a scrimmage with Dover-Sherborn,” Hathaway said. “I knew if we could develop a three on two, or get some corners. Then I used the timeout so we could just calm down and execute the set play. Franklin sent to game to overtime with a late corner. Cassi Ronan lifted a cross that fell into the area, and junior Regan Paterson pounced on the loose ball in the scrum and tied the game with 10.4 to play. The biggest stop of the game came in the final minutes of the first overtime period. A foot infraction was whistled against KP, and Franklin’s Victoria Quinn smartly hit the restart quickly, sending in junior Anni Walsh behind the defense. But KP senior goalie Abby Campbell was quick off her line and came sliding out to make the stop. King Philip had a strong start to the contest, scoring on its first penalty corner of the game just over three minutes in. Furfari found Connor wide open in front of goal for an easy tap in a 1-0 lead. Campbell made saves on Ronan in the 9th minute and then turned aside a chance from Walsh after she beat two defenders in the 13th minute. Franklin continued its pressure, having the better of play after KP took the lead. Finally, with just 50 seconds left, Ronan used a looping shot off a corner that hit off a KP stick and in to make it 1-1 heading into the half. Both teams had chances throughout the second half, with KP having the edge in play. Ronan’s hard shot through traffic was denied by Campbell in the 34th minute; Hathaway had a bid turned aside by Luccini in the 47th minute; and Luccini blocked a tough angle bid from Raegan Simeone in the 54th minute. But KP earned a corner shortly after Simeone’s shot and took advantage. Connor connected with Furfari, who passed along to Hathaway straightaway from goal. Franklin’s defense nearly sniffed it out, just missing an interception on the pass, and Hathaway ripped a low bouncing shot that found the back of the cage for a 2-1 lead with 6:12 to play. 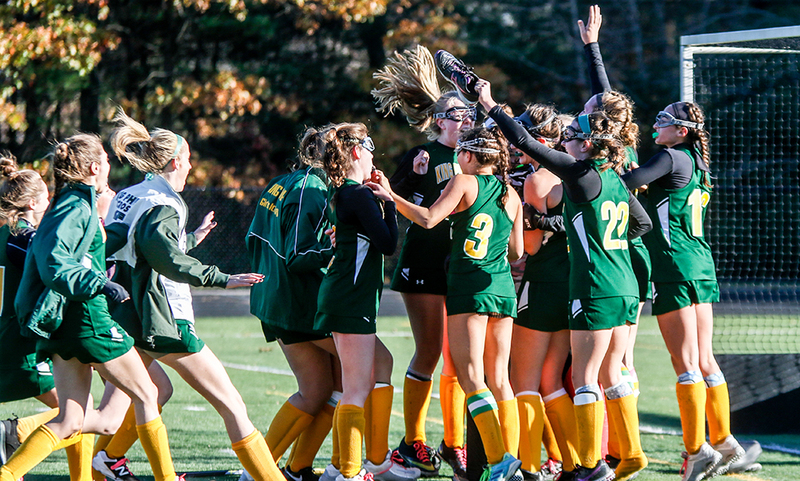 King Philip field hockey (16-2-1) advances to the next round of the D1 South tournament and will host #7 Needham. The game is currently scheduled for Monday, November 6th at 3:45. Franklin finishes the season at 10-8-2, and the end of the year also marks the end of Cropper’s tenure as head coach. Cropper spent a total of 14 years with the program, the last eight as head coach. She was hired as head coach at Dean College earlier this Fall. The Hornets clinched a spot in the state tournament by sweeping the season series with league champion KP on solid goaltending by Kayla Hunter (39) and a goal from Maggie Danehy (36). MANSFIELD, Mass. – Mansfield came into Monday night’s game at Alumni Field needing two more points to qualify for the state tournament. The Hornets were celebrating senior night, trying to bounce back from a disappointing loss to Franklin last time out and looking to sweep the season series against league champion King Philip. 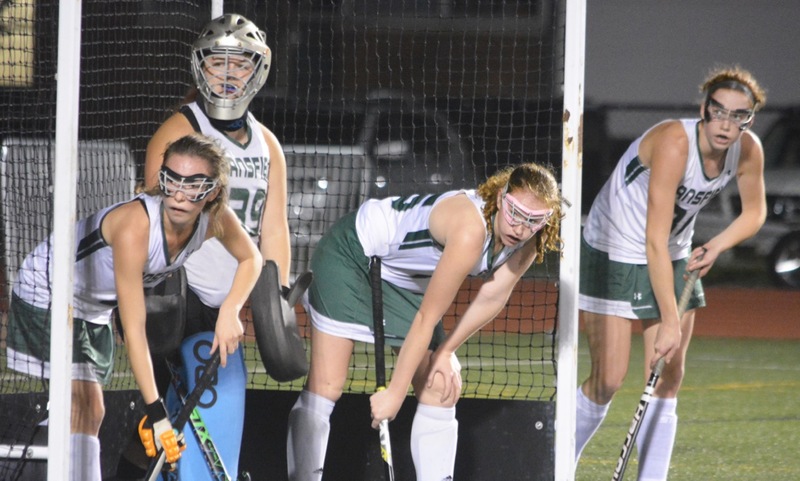 It was never going to be an easy task, even with the Warriors missing leading scorer Alli Meehan, but the Hornets rose to the task behind impressive goaltending from Kayla Hunter and a goal from Maggie Danehy to beat KP 1-0 and clinch a spot in the playoffs. KP had the first clear chance in the game when Liz Furfari fired a cross from the right side that skidded through the crease but neither Claire Lawler or Reagan Simeone could get the necessary touch to put it away. The next 10 minutes were completely dominated by the Hornets, who kept the Warriors pinned back in their defensive half and racked up a 7-to-1 edge in corners in the opening half. In one stretch, Abby Campbell had to use the blocker to deny a shot off a corner and then seconds later Emma Izydorczak needed to clear a shot off the line to keep it scoreless. The Warriors did have a couple of chances in the closing 11 minutes of the half when Katie Lindmark’s pass was tipped just wide by Furfari and then Hunter made a close range stop on Lawler. Danehy had a long-range effort turned aside by Campbell. Hunter was called upon numerous times in the second half as the league champions pressed for the go-ahead goal. Christina Hathaway saw her blast kicked aside and then moments later Furfari had a shot that was cleared off the line by a defender. The Mansfield defense was put under pressure but the combination of Julia Burnham, Brittany Larm, and Nicole Berluti kept the Warriors at bay with help from Danehy and Ann Maher in the midfield. In the 48th minute, Danehy nabbed the opening goal as she raced the length of the field to get the slightest of touches to a long distance rip by Danny Radev. The ball eluded the leg of Campbell and just beat the stretch of Izydorczak to cross the line. The strategy was working for the Warriors with Furfari setting up Simeone only to have the tip go just wide and then having her own shot kicked away by Hunter. The Mansfield goalie was also forced into a solid save by Caroline Klim, teed up by Hathaway off a corner. As the clock wound down to zero, the Hornets all stormed the field and surrounded Hunter in goal, a clear sign of how important this game was to Mansfield. Mansfield (7-5-4, 7-4-4) will travel to Oliver Ames on Wednesday before hosting Foxboro in a non-league game on Friday to close out the regular season. King Philip (14-2-1, 13-2-0) will travel to Franklin on Wednesday to close out its regular season. WRENTHAM, Mass. – Despite forcing 20 saves out of Franklin goalie Christina Luccini (20 saves) and having a 12-to-3 edge in corners, King Philip went into a timeout with a little under five minutes remaining tied with the visiting Panthers at two goals apiece in Monday evening’s Kelley-Rex rivalry game at Macktaz Field. KP coach Liz Hathaway brought her players to the huddle to draw up a corner that she hoped would finally break the deadlock that Luccini and the Panthers defense had held for more than 20 minutes. Nicole Connor played the ball out to the edge of the circle and it was fired into a mass of bodies. The ball kicked around for a few seconds before popping out to Dana Truini and the junior midfielder knocked it past the scrambling defense and into the back of the net for the go-ahead goal. It would turn out to be the winner for the Warriors, who tacked on one more to beat Franklin 4-2 and rebound from last week’s loss to Mansfield, which was KP’s first of the season. It also ensured a two-point lead over Oliver Ames in the division, as the Warriors go after their first league title since 2008. KP got off to a quick start, forcing Luccini into eight saves in the first half, including one on Claire Lawler just a few minutes into the game. After the Franklin defense cleared a chance off the line and Alli Meehan watched a shot skip just wide, KP finally found the breakthrough and added a second just 30 seconds later. The first goal came off a rebound as the ball was kicked into the crease but was quickly pounced on by the Warriors. Connor was officially given credit for the goal, although it was Truini who brought the ball back to midfield. KP forced a turnover right after the restart and came right back at the Panthers back line. Meehan stick-handled through a couple of Franklin defenders, driving at the goal from the right side, and coolly slid the ball past Luccini (Liz Furfari getting credit for an assist). The game felt fully in the grasp of the Warriors until Franklin earned a corner with 11 minutes remaining in the half. The ball was played out to Cassi Ronan and the junior flicked a looping shot over the stick of KP goalie Abby Campbell (eight saves) and in. The ref initially waived the goal off but after a discussion it stood and cut the lead in half. The momentum carried over into the second half and Franklin completed the comeback. Regan Paterson had her first effort, set up by Annie Walsh denied by Campbell (her only save of the second half) with a point-blank block, but Paterson knocked in the rebound to make it 2-2. Franklin’s second goal spurred KP on and the Warriors created chance after chance only to continually be denied by Luccini. She stopped three shots in one sequence off a corner (two saves on Meehan) and then made a diving stop to deny Lawler at the back post. She then stuffed two chances by Lawler again, kicking the shot aside. With four minutes left, Truini finally got one past the Franklin goalie, setting off a celebration that was a mix of excitement and relief. With 1:40 remaining in the game, KP sealed the win on another corner. Meehan drove at the defense, forcing it to collapse, and dropped a pass to Christina Hathaway, who blasted it through traffic for the insurance goal. King Philip (8-1-0, 7-1-0) will play back-to-back games to finish the week with Stoughton on Thursday afternoon and Algonquin on Friday night. Franklin (3-4-2, 3-3-2) will try to bounce back on Thursday against Canton before hosting Chelmsford on Sunday morning. Mansfield, 3 @ Attleboro, 0 – Final – Mansfield senior Cullin Anastasia netted a pair of second half goals as the Hornets secured a shutout win on the road. Jackson Murphy opened the scoring for the visitors, converting a chance from Sean Lanzillo to take a 1-0 lead into the break. Murphy then set up Anastasia for Mansfield’s second goal and John Cooney recorded to assist on the final tally. Nick Ferraz recorded his third shutout in net. Canton, 0 @ Milford, 2 – Final – Milford junior Anthony Salvador scored what turned out to be the game-winning goal in the first half, and then drew a penalty late in the second half to help the Hawks record a shutout win over visiting Canton. Wallison De Oliveira converted the penalty kick to seal the win. MHS head coach Brian Edwards praised the defensive efforts of senior Jacob Balzarini. Stoughton, 0 @ Foxboro, 8 – Final – Hussein Kafel, Joe Cusack, and Nick Esposito each scored a brace for the Warriors. Shane Vandenboom had a pair of assists, Cam Cass had a goal and an assist, and Matt Rongione had the other goal for Foxboro. Click here for a photo gallery from this game. Taunton, 1 @ Franklin, 4 – Final – One senior and three juniors each recorded a goal for Franklin in the Panthers’ win at home. Senior Liam Kapples along with juniors Nitin Chaudhury, Nasir Brahimi and Sam Molloy each found the back of the net once for FHS. King Philip, 1 @ Oliver Ames, 4 – Final – Oliver Ames scored a pair of goals in each half in a key division win over visiting King Philip. Senior Michael Nikiciuk opened the scoring while classmate Brandin Osborne made it 2-0 by half. Mason Galbato converted a flick from Nathaniel Cardoza off a long throw in by Chris Lawrence to make it 3-0 and minutes later, senior Matt Alvarado made it 4-0. In the final minute of play, KP junior John Cullen played a through ball to freshman Camron Lawrence who played across to freshman Ajae Olsen for the finish. North Attleboro, 2 @ Sharon, 1 – Final – North Attleboro took the lead inside the first 10 minutes and netted the game-winner midway through the second half to pick up a key division win on the road. Sophomore Dylan Corrigan opened the scoring in the sixth minute, converting a long goal kick from Zach Matracia. Gabe Pinhancos doubled the lead in the 63rd minute on a feed from Ryan Pasquel. Sharon sophomore Michael Baur converted a penalty kick in the 76th minute. NA goalie Brendan Matracia made three key saves down the stretch for the Rocketeers. Attleboro, 1 @ Mansfield, 4 – Final – Stephanie Kemp scored a brace and Cassidy McMahon had a goal and an assist for the Hornets, who stayed perfect on the season. Attleboro battled throughout and cut the Mansfield lead to 2-1 midway through the second half on a goal by Julia Reyes, assisted by Alison Wall. As the Bombardiers pushed forward for an equalizer, Mansfield scored two more to seal the two points. Madison Brown made 12 saves in the loss and, according to coach Steve Santos, Jordyn Forte and Julia Hayes played well on defense. Canton, 3 @ Milford, 3 – Final – Milford got a pair of goals from Juliana France and one from Maggie Boyle to earn a draw against the Bulldogs. According to Milford coach Jay Mastaj, Ashleigh Starks also played well for the Hawks. Foxboro, 4 @ Stoughton, 1 – Final – Stoughton took the lead on the Warriors with a goal by Nicole Weir, assisted by Gabbi Diaz. 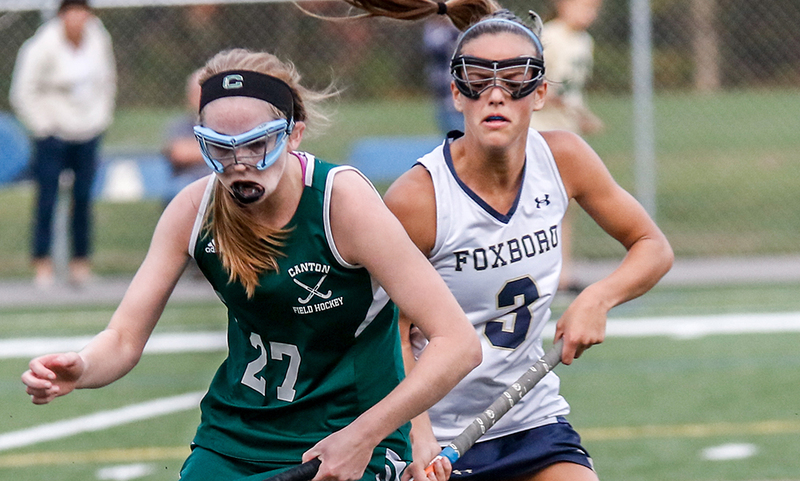 Foxboro responded with four straight goals to get the win, including a pair of goals from Lily Sykes. Katelyn Mollica scored the eventual game-winner before halftime and Jordyn Collins scored early in the second half, before Sykes wrapped up the win with a shot from distance. According to Stoughton coach Tara Daniels, outside backs Cintia Khouzami and Sarina Hutchinson had “outstanding” games. Franklin @ Taunton – Postponed to 9/20 at 4:00. Oliver Ames, 2 @ King Philip, 1 – Final – Chloe Layne scored a penalty kick to give the Warriors the lead in the fifth minute, but OA bounced back with two goals before halftime to hand KP its first loss of the season. Abby Hodges scored off an Sophia Cox corner kick to tie the game and Erin Holmberg bent a corner directly in for what turned out to be the game-winner. Regan Benton made 14 saves for the Tigers and drew praise from KP coach Gary Pichel, who said that Benton was “clearly one of the best goalkeepers in the state.” OA coach Britt Sellmayer said that Maeve Hogan played a strong game in the OA defense. Sharon, 0 @ North Attleboro, 5 – Final – It took North only 58 seconds to jump into the lead with a goal from Kayla Pasquel, assisted by Ashlyn Gaulin. Aine Mendonca made it two off another Gaulin assist and Leah Jette made it 3-0 off a Pasquel assist. Gaulin added a pair of second half goals, one off a Haley Guertin shot and the second on an assist by Mackenzie Rosenberg. Emma Noreck had the clean sheet for North and head coach Bill Wallace praised Aly Blaisdell, Felicity Monfils, Britta MacDonald, Haley Ferrin and Emma Gaulin for strong play on both ends of the field. 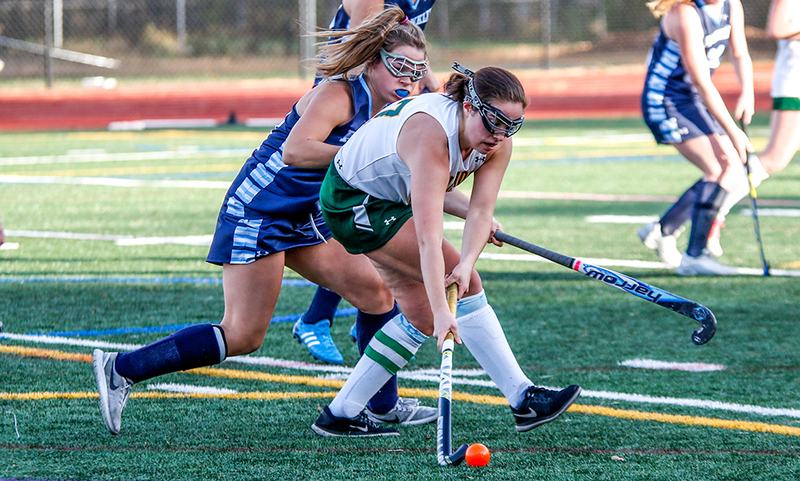 Mansfield, 6 @ Attleboro, 1 – Final – Senior Ann Maher scored a hat trick to pace Mansfield to a win on the road. Heather D’Ambra, Brooke Downey and Haley Crawford each tallied once for the Hornets in the win. King Philip, 5 @ Oliver Ames, 0 – Final – King Philip’s Christina Hathaway scored and had an assist in the first half, helping the Warriors build a 2-0 lead at the break. Hathaway scored on a feed from Nicole Conor and then set up a goal by Liz Furfari. Furfari made it 3-0 of a pass from Alli Meehan and then Meehan netted the final two goals, one set up by Olivia Kulesza. Abby Campbell turned away three shots in net. Mansfield, 3 @ Attleboro, 1 – Final – After splitting the first two sets, Mansfield rattled off two wins to earn the victory on the road (25-23, 19-25, 25-16, 25-16). Julia Harrison had eight kills while Mikayla Kearney had seven digs and eight service points. Emma Ascoli added 14 service points and 24 assists for the Hornets while Jolie O’Neil chipped in with 10 service points. Milford, 1 @ Canton, 3 – Final – Milford earned a win in the first set but Canton rallied back to win the next three and take the victory (21-25, 25-12, 26-24, 29-27). Nicole Brown ran the Canton’s offense with 37 assists, Taylor Harris had 13 kills and four aces and Rose Hazam and Erin Devine combined for 14 kills. CHS head coach Pat Cawley said Theresa O’Brien provided a spark off the bench with 14 service points. Stoughton, 3 @ Foxboro, 0 – Final – The Black Knights stretched their unbeaten streak to six wins to start the season with a 25-14, 25-12, 25-14 sweep of Foxboro. SHS junior Hanna Holden had a strong game with 14 assists and 9 digs while senior Haley Stone and junior Mia Bennett were solid in the back row combining for over 30 digs. Taunton, 0 @ Franklin, 3 – Final – Franklin’s Ellie Wisniewski had a strong well-rounded game, leading the Panthers to a sweep at home. Wisniewski had seven kills, five aces and two digs while Meaghan Maguire added eight kills and Lauren McGrath finished with 24 assists, three digs, three aces and two kills. Sharon, 0 @ North Attleboro, 3 – Final – North Attleboro survived a late push from visiting Sharon to complete a sweep (25-11, 25-12, 26-24) and move to 5-0. Senior Kezia De La Cruz had 13 kills and two assists, senior Amelia Murphy added nine kills and senior Leah Marceau paced the offense with 20 assists and four aces. King Philip, 3 @ Oliver Ames, 0 – Final – King Philip went on the road to pick up a sweep of the Tigers, 25-19, 25-11, 25-12. Sydney Phillips led the offensive charge with 11 kills and three digs while Michaela Palumbo added six kills, three aces and 11 service points. Kat Kmetz chipped in with five aces, two kills, one dig and 16 service points. Foxboro @ Franklin – Postponed to 10/18 at 3:00. Oliver Ames @ Taunton – Postponed to 10/17 at 3:30. Sharon @ Canton – Postponed to 10/13 at 3:00. Stoughton @ North Attleboro – Postponed to 9/27 at 3:00.